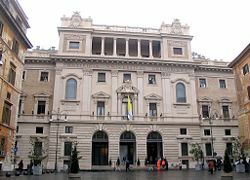 Pontifical Gregorian University (Italian: Pontificia Università Gregoriana) is a pontifical university located in Rome, Italy. Heir of the Roman College, the Gregorian University is one of the oldest universities in the world today. It was the first Jesuit university in the world, being founded by St Ignatius of Loyola in 1551. Containing faculties and institutes of various disciplines of the humanities, the Gregorian has one of the largest theology departments in the world, with over 1600 students from over 130 countries. 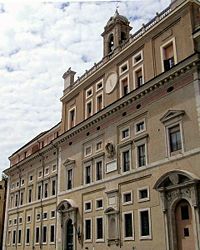 As a pontifical university, Gregorian University functions primarily as the higher education center for Roman Catholic clergy, and among its graduates are counted numerous popes, saints, and beatified persons. In addition to those planning to enter the clergy upon completion of their studies, Gregorian University also welcomes many other students, both of the Roman Catholic and of other faiths. This diversity serves to enhance the education of those entering the clergy as well as providing the opportunity for those non-clergy to experience the highest level of theological study in an unparalleled religious and historical environment. On the Gregorian University's website, the page of Intent states several missions of the school, the most important being the university's assistance to Catholic churches all over the world. To accomplish this end, the university educates its members to the fullest extent of Catholic tradition, but also prides itself in incorporating certain elements of liberal arts and sciences. The stated purpose of this is to both deepen the student's understanding of God through new scientific breakthroughs as well as to give them an understanding of some of the modern arguments against belief in God. By incorporating such worldly perspectives with traditional teachings of dogma, the university hopes to produce church members and workers who are secure in their faith and conviction as well as capable of living and working in the modern world. Within the Catholic faith, the Gregorian University has an excellent reputation for transmitting discipline, knowledge, and tradition to its students. Because of its vast collections and historical origins, it is also regarded as an excellent academic school. Most of its students upon graduating either become scholars or clergy members. St. Ignatius of Loyola, founder of the Society of Jesus (Jesuits), with financial patronage from Cardinal St. Francis Borgia founded a "school of grammar, humanity, and Christian doctrine" on February 18, 1551, in a house at the base of the Capitoline Hill. With a small library connected to it, this school was called the Collegio Romano (Roman College). Within the first year, due to the number of students, the site was transferred to a larger facility behind the church of San Stefano del Cacco. After only two years of existence, the Roman College already counted 250 alumni. 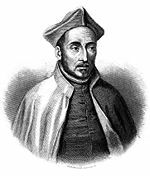 St. Ignatius of Loyola founded the Roman College in 1551. In January of 1556, Pope Paul IV gave the College the authority to confer academic degrees in theology and philosophy, thereby raising the school to the rank of university. During the following two decades, due once again to an increased number of students, the university changed locations twice. During this period, a chair in moral philosophy was added, and a chair in Arabic was added to the already existing chairs in Latin, Greek, and Hebrew. With the university counting more than a thousand pupils at this point, Pope Gregory XIII wished to give it a more suitable headquarters. Expropriating two blocks near the Via del Corso, the architect Bartolomeo Ammannati was commissioned to design a grand new edifice for the institute, which was inaugurated in 1584, in what became known as the Piazza Collegio Romano, across from the Doria Pamphilj Palace. For his huge sponsorship of the Roman College, Gregory XIII became known as it's "founder and father," and from that point the school acquired the title of the "Gregorian University." The university in its new space was able to augment the number of disciplines that were taught. New chairs of Church history and liturgy were added. At this time, the university also assumed a great prestige in the fields of mathematics, physics, and astronomy. The discoveries which lead to the foundation of the calendar currently in use the world over (the so called "Gregorian calendar" since it was established by Gregory XIII) were made by the Jesuit Christopher Clavius, a professor of the university at the time. The illustrious Jesuit mathematician, physicist, and inventor Athanasius Kircher also taught at the university during this period. Not long after assuming its new headquarters, the student body increased to over two thousand. The university chapel, no longer able to hold such a large number of students, was rebuilt as the Church of Sant' Ignazio between 1626 and 1650, becoming one of the major Baroque churches of the area. In 1773, following the suppression of the Society of Jesus, the university was given over to diocesan clergy or Rome, but after their refoundation, it was once again given back to Jesuits on May 17, 1824, by Pope Leo XII. The previous site of the Gregorian University, now a public high school. Following the takeover of Rome by the revolutionary army of the new Kingdom of Italy in 1870, the new Italian government confiscated the property of the university, which forced the university to transfer once again, this time to the Palazzo Borromeo on the Via del Seminario. It was at this point that Pope Pius IX permitted the school to assume the title of "Pontifical University." With the difficult situation after Rome's takeover, the academic endeavors of the university were dramatically affected. Due to a lack of space the university had to drop all faculties except for theology and philosophy. The number of students had dropped dramatically as well because of the dislocation, so that in 1875, it had no more than 250 students. However, the university was able to gradually build itself up again. In 1876, the Faculty of Canon Law was transferred from the University of Rome La Sapienza to Gregorian, and the university was gradually able to resume the teaching of many disciplines. After the First World War, Pope Benedict XV and later Pope Pius XI worked to create a new site for the university that would be better suited to its needs, since it was still operating out of the Palazzo Borromeo. Pope Benedict was able to acquire an area at the base of the Quirinal Hill, adjacent to another school under the Jesuits, the Pontifical Biblical Institute, while Benedict's successor, Pope Pius XI, laid the first stone of the new seat of the university on December 27, 1924. Designed by the architect Giulio Barluzzi in the neoclassical style, the new edifice was complete by 1930. The current site of the Gregorian University with the Ammannati-designed façade. After assuming its new location, the university continued to expand, both in the number of faculties and disciplines taught, as well as in its geographic site. Today, the Gregorian University includes six faculties and four institutes, and is located in four palazzos in the area around Piazza della Pilotta. The university currently has about 3,000 students, from more than 130 countries. The majority of the students at the Gregorian are priests, seminarians, and members of religious orders. The majority of the professors are of the Jesuit order. However in recent years, there has been a higher representation of laity in both the faculty and student body. Since the Gregorian is a pontifical university, the Holy See accredits its curriculum, and its degrees have full effects in canon law. The most impressive facility of the Gregorian University, besides its lecture buildings, is the library. Gregorian University has an extensive library, consisting in nearly 900,000 volumes, particularly noteworthy in areas of theology, philosophy, culture, and literature. The library was founded together with the Roman College by St Ignatius Loyola. In 1872, however, the library's 45,000 volumes, manuscripts, and archives were confiscated by the new Italian state, were dispersed and partially expropriated by the Vittorio Emanuele II National Library of Rome. Since 1928, the library has been located on the university's new campus. The majority of the library's collection (820,000 volumes) is housed in a six-floor tower adjacent to the Palazzo Centrale. An additional 60,000 volumes are housed in any of the six reading rooms, which together can accommodate seats for up to 400 students. The library's reserve contains many ancient and precious books, as well as many rare editions, including 80 sixteenth century books. Theology: Offering degrees in Biblical Studies, Patristics, Theology, and History, Dogmatic and Moral Fundamentals, the Theology program is essentially a Seminary school that prepares students to enter the clergy upon completion. Canon Law: Program offers in-depth training and understanding of the Canon Law tradition of the Catholic Church. Philosophy: While focusing in on philosophies that correspond to the traditions and beliefs of the Catholic Church, the philosophy program nonetheless prepares students to develop the reading, writing, and analytical skills to pursue academic careers in the general area of philosophy. History and Cultural Patrimony of the Church: Program of study devoted to the study of the Catholic Church at all times in history. Missiology: Program of study prepares students who will act as missionaries around the world for the Catholic Church. Social Sciences: The social sciences program offers studies in the areas of Education, Economics of Development, Sociology, Social Communication and Doctrine, and Social Ethics. In addition to the five main programs, there are three smaller, special programs of study the university offers. Social Communications: Designed to give students who will be entering the clergy the tools and understanding of how mass communications, in particular the mass media, affect the Church and its teaching and the best ways to use these technologies to the benefit of the Church. Jewish Studies: The Jewish studies program is based on the understanding that Jews and Catholics share a similar spiritual base and the program is designed to not only strengthen the understanding of Judaic traditions but also to foster cooperation among Jews and Catholics. Laikos: The Laikos program emphasizes the importance of Greek culture and history in the development and origins of the Catholic Church. Students come from around the world to study at the Gregorian University, and therefore the school's population is a blend of ethnicities, cultures, and sometimes even religions. This gives the students the opportunity not just to learn about other ways of life, but also helps potential clergy members to understand how the same religion (in most instances Catholicism) can be practiced and viewed differently from one community and country to the next. The university's location gives the student body even more opportunities. Rome is one of the oldest cities in the world, as well as one of the most historic. Living in Rome gives the students an opportunity to explore history, both secular and religious. It is also is a major cosmopolitan center of the world, offering everything available to the major modern cities of the world. However, the students at Gregorian University are not known for partying or leisure time. Studies are taken very seriously and students spend most of their time working and learning. According to article 16 of the Lateran Treaty, signed in 1929 between the Italian government and the Holy See, the Gregorian University enjoys a certain level of extraterritoriality. According to this treaty, Italy can never subject the university to "charges or to expropriation for reasons of public utility, save by previous agreement with the Holy See." It is also exempt from all Italian tax, and is included among those Roman buildings for which the Holy See has the right to deal "as it may deem fit, without obtaining the authorization or consent of the Italian governmental, provincial, or communal authority." 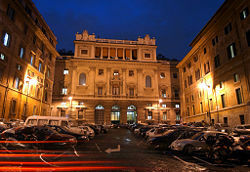 The Gregorian University is one of three member institutes that make up the Gregorian Consortium, the other two institutions being the Pontifical Biblical Institute and the Pontifical Oriental Institute. The Consortium was created under Pope Pius XI in 1928, and currently all member institutions are supported by the Society of Jesus. The vast majority of the Church's leading experts and members of the College of Cardinals hail from the Gregorian University. ↑ Pontificia Universita Universita, Of Intent. Retrieved November 20, 2007. 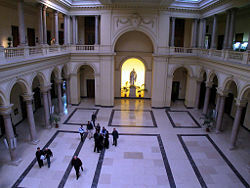 ↑ Pontifical Gregorian University (2004), Pontifical Gregorian University Library. Retrieved November 21, 2007. ↑ Pontifical Gregorian University (2007), General Information. Retrieved November 21, 2007. ↑ The Gregorian University Foundation (2007), Students-Legacy of Leadership. Retrieved November 23, 2007. ↑ Michael Scheifler's Bible Light (2007), Lateran Pacts of 1929. Retrieved November 23, 2007.